Izannah Walker Chronicles: Thank You, Generous Izannah People! Thank You, Generous Izannah People! Withington Auctions before the doll sold. A lot more gray hair here! 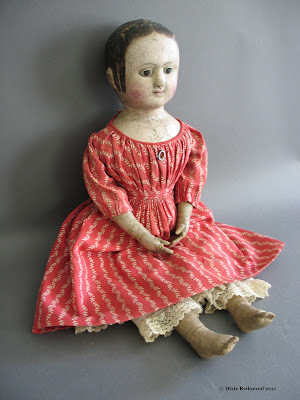 When I first started studying antique Izannah Walker dolls, the only images and information I could find were in books and magazines, and there were not many images. So I set out to create what I wish existed. I traveled to Lucy's Doll House and to Withington's to take pictures of original Izannah Walker dolls. Those trips were joys - and still are in my memories. These two businesses started me on my way with these studies. As time has gone by others have begun to share images of Izannahs and information as it comes along. I appreciate it so much. It is because of the generosity of auctioneers and collectors and museums that this site exists for those who cannot travel to see Izannah Walker dolls. Thank you to all of you who share images and information freely for people who cannot travel to see original Izannah Walker dolls. Me at the beginnig of the journey! In the time that I have been studying Izannahs, my hair has gone from brown with some gray to mostly white, and I have written a published article about Izannah Walker dolls with my dear friend Edyth O'Neill. The article was originally published in Early American Life magazine. Izannahs have been and always will be part of my life story. I am thankful for this journey. originally published in Early American Life. I think in history from this time on, Izannah Walker will be synonymous with Dixie Redmond. Thank YOU for all your research and hard work that has benefited all of us! Dixie thank you very much for such an interesting and time-consuming job ! 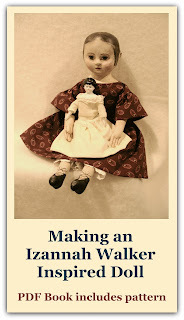 Thanks to you and your blog learned about dolls Izannah Walker and fell in love with them! Made while only two dolls, by the approach of another. Dixie - You have made a ripple effect in the Izannah doll lovers world. I am sure that many, many people who have gone ahead to make reproduction Izannahs would not have done so without all of the information and pictures you have generously shared and combined for all to partake of. Your enthusiasum for these wonderful dolls is contagious. Thanks for your diligence and hard work! Your love and admiration for the Izannah Walker dolls is contagious, yes indeed. You have and continue to share and document this personal and public undertaking from which we all, with similar interests and desires, have gleaned many hours of benevolent charity. 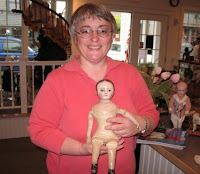 Thank you Dixie, as I have told you before, my doll mentor!